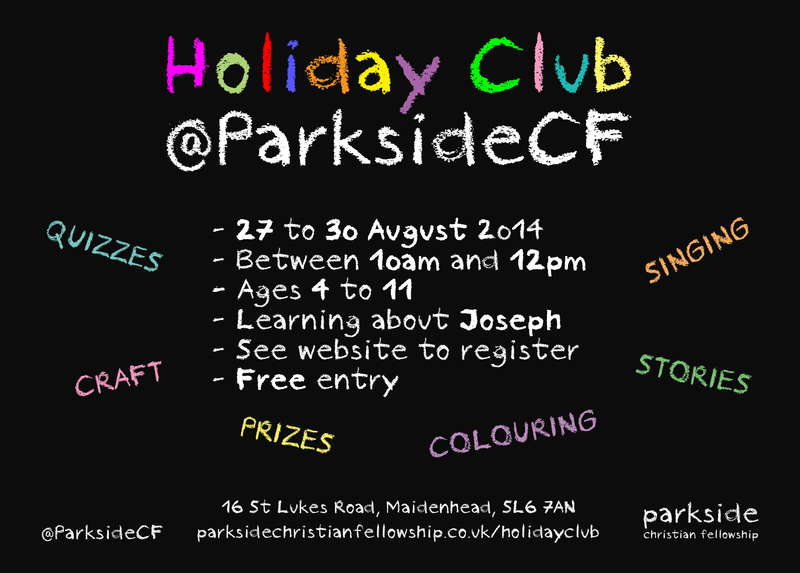 We’re planning a Holiday Club at Parkside for children during the last week of the summer holidays. This is planned to be from 10am to 12pm between 27 and 30 August and is open for children between the ages of 4 and 11. During the week, we’re planning to explore the story of Joseph. There will be lots of activities to enjoy, including singing, craft and quizzes. There will also be an opportunity to win prizes during the week. The Holiday Club is free to attend. On the Sunday after the Holiday Club ends, we’ll have a special service for parents of those who came along during the week, where we’ll look back at the Holiday Club and also give out prizes. This will be from 11:30am and will be followed by a BBQ lunch, to which all are welcome to stay. If you are interested in coming along to the Holiday Club, please download and complete the registration form below and return it to us as soon as possible as spaces are limited.